Virginia Intermont College senior Erika Jewell (on horse) competed for the Cacchione Cup at IHSA Nationals four consecutive seasons. Jewell was out of the ribbons in 2003, eighth in the nation in 2004, fifth in 2005 and the Reserve National Champion in May of 2006. HARRISBURG, PA - It might be hard for some to believe but only ten years ago 20 riders competed at IHSA Nationals in the Cacchione Cup Competition. In 2006 the number of competitors reached 30, with the addition of a new region made up of schools in Central Pennsylvania (ironically this new regions' territory includes the Harrisburg area, site of this year's IHSA National show). Twenty-nine of the thirty entries had finished with the most combined open level flat and fences points within their respective regions, automatically earning a trip to IHSA Nationals to compete for the cup. The Central Pennsylvania region featured the only tie nationwide for the top spot, as Penn State freshman Samantha Pandolfi rallied to catch 2005 Cacchione entry and Penn State teammate Jennifer Betts. A ride-off between the two was held at Zone 3, Region 1 Regionals, with Pandolfi earning her first trip to Nationals. Pandolfi was actually one of many riders who unseated a 2005 IHSA Nationals Cacchione participant. Renae Beggs of Cal Poly - San Luis Obispo was ahead in Zone 8, Region 1 at the mid-season break, but Stanfords' Sarah Willeman was perfect in the spring to qualify from Northern California. Caitlin Lane of Washington & Lee got ahead of Jennifer Champagne of Hollins early in the season and never reliquished the lead in Zone 4, Region 3. Lane had competed for the cup at 2004 Nationals in Murfreesboro, then watched Champagne get ahead early in the 2004-05 season much like what Lane was able to accomplish this season. Three of the four regions in New England saw riders miss out on a chance to compete two seasons in a row, and in each case a member of the same team dethroned them. Dartmouth sophomore Daisy Freund had the lead early, then watched teammate Tim Malone pull ahead in March of '06; Brown junior Whitney Keefe had some very good shows in October, taking the lead on senior Jamie Peddy and not giving it back, and Kyla Makhloghi of Mount Holyoke College, the reserve National Champion at 2005 Nationals in Sunbury, Ohio did as well as you can to stay in a race when your teammate scores a second or higher in thirteen of the sixteen classes held in your region during the regular season. MHC junior Nathalie Cooper was third three times, second five times and a winner eight times (half of her rides) in Zone 1, Region 3 shows. Incredibly, Makhloghi was a winner eleven times in sixteen tries but a pair of low placings over fences on two separate occasions resulted in Cooper winning out by a 93-90 score. Nine riders from the 2005 Cacchione competition did survive somewhere between six and ten regular season shows to qualify again in '06. 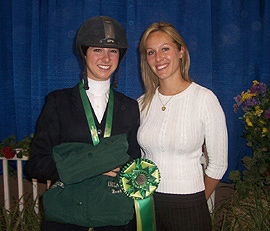 These returnies included University of Oregon junior Kaitlyn Kleck, who placed ninth in the Cacchione in '05 and whose cousin Ashley Kovar would compete for Ohio State in the AQHA Cup class as had been the case one season ago; Kristine Kennedy of Drew University, who as a junior had finished third overall in the Cacchione while having the best performance in the work-off round; and Ashley Woodhouse of Skidmore College, who as a sophomore had to win a ride-off at Regionals to reach the cup competition. Perhaps the close race helped, as Woodhouse was the 2005 Cacchione National Champion. In 2005-06 Woodhouse finished eight points ahead of Dana Kendrick of Cornell in Zone 2, Region 3. Would Woodhouse become the first rider to win consecutive Cacchione Cups since CeCe Williamson did it three times for the University of Virginia from 1981 to '83? The schedule for 2006 Nationals was very similar to that of '05, with the first day made up entirely of hunter seat classes. The individual open fences was the third class on day one and included four riders who would ride in the afternoon within the flat phase of the Cacchione Cup. Three of the four riders common to both classes were out of the ribbons in individual open fences. However Stanfords' Willeman received a score of '90' from judges Robert Bielefeld and Linda Andrisani, which was tops in the class. This would not be the last time Willeman would receive a blue ribbon at 2006 Nationals. Like Jewell, Savannah College of Art & Design senior Jordan Siegel (left, with Bees Head Coach Ashley Kelly) made four appearances in the Cacchione between 2003 and 2006. Siegel was sixth out of 30 participants in her final appearance. Willeman and fourteen others took part in the seventh class of 2006 opening day, section "A" of the Cacchione Cup flat division. Willeman was even better this time, earning a score of '92.' Virginia Intermont College senior Erika Jewell was the only other rider in the first section to reach the 90's, scoring exactly 90. Six riders scored in the 80's, including seniors Jordan Siegel of Savannah College of Art & Design with an '88' and Mary Markvan of West Virginia University with an '87.' 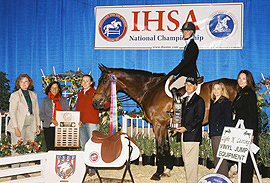 Both Siegel and Jewell had competed for the cup at each of the previous three IHSA National shows. Neither had won the Cacchione, but both were certainly off on the right foot in their last attempt to be crowned the best hunter seat open rider in the IHSA for the 2005-06 season. Following the individual novice flat, the ninth class of the day featured the other fifteen qualifiers for the Cacchione Cup in their turn on the flat. No one scored in the '90's, however Lane and Malone both earned '89.5' from Bielefeld and Andrisani. Only six riders scored '80' or higher in section "B," with Woodhouse's '86' the next best score after 89 and a half. Between the two flat sections, the seniors were dominating, with Malone the only non-senior in the top six headed into the jumping phase. All 30 riders showed up at the draw table before 8AM on Friday, May 5th to determine which horse each would ride and in what order each rider would compete. Unlike the past two seasons, when rubber ducks with numbers written on the bottom were pulled out of a pond to match riders to horses, a gumball machine with numbers stamped on the gumballs was used. Riders for each hunter seat class gave the handle on the machine a turn, waited for their gumball to roll to the bottom, then matched the number on the gumball to the horse draw list. Stacey Helgren of the University of Wisconsin at Madison drew horse number one and thus would ride first in the division. Krystal Mack of New Mexico State had the gumball for the 30th horse in the draw and would thus jump after the other 29. Following the alumni fences which started the show at 8:39AM, Helgren was first into the ring at 9:24AM, having by all accounts a good round with a score of '83.' Elizabeth West of the University of the South went second. One of only four freshman in the entire Cacchione division, West would be one of six riders to score '60' or lower, apparently victimized by a refusal. Kennedy was third into the ring, scoring a '76.5.' Kleck went fourth and earned a '78.' Kelsey Ostberg of the combined University of Notre Dame/Saint Mary's College (IN) was fifth into the ring and earned a '64' (Though it has happenned in the past more than once, Notre Dame and Saint Mary's were the only combined schools to ride as one team within the IHSA during the 2005-06 season). Sarah Titlow, who was the entire Pepperdine University team this season, earned a '58' in what turned out to be the seniors' final IHSA undergraduate ride. Yet another senior was seventh into the ring. Riding at IHSA Nationals for the first time, Jodie Weber of Sweet Briar College earned the highest score so far over the jumps, earning an '88' to go with an '81' on the flat a day earlier. Ohio University freshman Kathleen 'Kati' Cibon went eighth and was given a '61' score. Siegel then made her bid for the top spot overall, earning an '84.5' to go with her '88' yesterday. Siegel thus temporarily had the highest combined score. As a freshman in 2003 Siegel had placed third in the nation with the fifth-best jumping score. Could Siegel improve on that performance in '06? Stony Brook University junior Rachel Cresswell was tenth to go, earning a score of '46' as it appeared at the time. However Cresswell would get a re-ride at the end of the class. Defending champion Woodhouse was next, becoming the fourth rider into the 80's with an '81.' Rutgers University senior Erica Bello finished up her undergraduate IHSA career with a '79.5' in the fences phase. Thirteenth into the ring was Willeman, who for the first time in any class or phase of such at 2006 Nationals did not have the top score. Willeman was nearly perfect nevertheless, earning a jumping score of '87,' second to Weber at the time. Lane followed Willeman, and appeared to earn a score of '75.' However like Cresswell, Lane would be given a re-ride later on. Meghan Sederholm of the College of Southern Idaho brought the jumping phase to the halfway mark. The senior who took part in the 2005 Cacchione competition scored a '63' in what turned out to be her final IHSA undergraduate ride. Pandolfi was the third freshman to go, earning a '73.' Lauren Brown of Berry College went seventeenth and earned a '40' due to a refusal. Jewell became the first rider since Willeman to reach the eighties, earning an '82.' Nineteenth in the order of go was Haley Hicks of Boston University, the final freshman to compete. Hicks' score of '77' was the best jumping score of the four frosh entered. Malone then made his bid towards the highest average through two phases. The junior from Newtown, Connecticut received a score of '80,' giving him an average of 84.75 and almost certainly earning a place in the work-off. With two-thirds of the fences rides complete, Whitney Keefe of Brown University became the third rider in a row from Zone 1 to have a go. And what a go it was! If one did not know much about riding and could only judge good from bad by the sound of the audience they would have concluded that Keefe had the best ride. And this assumption would be correct. The sophomore from Wellesley, Massachusetts earned an '89,' moving Weber to second and Willeman to third in the fences scoring. Following Keefe's briliant trip, the next five riders did not keep their dreams alive for the work-off phase. Casey Finnell of Kansas State earned a '71.5,' followed by a '75' for Miami of Ohio junior Jennifer Hutson, who had placed seventh in the Cup competition last season. Brittan White of Saint Lawrence ('60'), Katie Carssow of the University of Pennsylvania ('55') and Markvan ('50') all encountered some sort of problem which knocked their scores down considerably. Talk about consistancy! 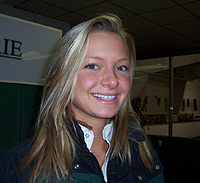 Ashley Delzer of Michigan State received a score of '84' in the flat phase, '86' in the jumping phase and '85.5' in the work-off phase of the Cacchione competition. Lane's re-ride was a huge success, resulting a score of '84.75.' Creswell put herself on the callback bubble with a '79' to go with her '82' flat score. Now everyone waited to see who ranked where and how many riders would be taken for the work-off. Before the team intermediate fences was completed, the combined flat/fences rankings were posted. Willeman led the way with an '89.5' average, followed by Lane ('87.12'), Siegel ('86.25'), Jewell (an even '86') and Delzer (an even '85'). If history meant anything, each of these riders were assured a place in the work-off, as at least five riders had always been selected to return for this phase since the current method of holding the Cacchione class at Nationals went into place in 2003. But with ten riders selected in the work-off in '03, only five in '04 and seven (!) last season, the riders below fifth had to sweat it out for another hour, as no annoucement of how many riders Andrisani and Bielefeld were extending another chance to had been made. Malone ('84.75'), Weber ('84.5'), Cooper ('83.75'), Woodhouse ('83.5'), Keefe ('82.5'), Mahoney ('81') and Cresswell ('80.5') all averaged 80 or better, and considering that at 1998 Nationals twelve riders were allowed to compete in the final elimination phase there was still a chance that each could make the work-off. A little later in the day the judges decided to take the top ten for the work-off, meaning Keefes' big score over the jumps had made her the final qualifier. The Work-off was the second class held on day three of 2006 Nationals. The first class had been an emotional one, as Makhloghi had placed second in team open fences to give Mount Holyoke a 23-22 win over both Stanford and Penn State for the Hunter Seat National Championship. Weber had won the class, giving Sweet Briar 18 points and fourth place overall while Willeman had placed third, raising Stanfords' total to 22 but not putting the Cardinal over the top for the national title. Woodhouse had placed fifth in the division while Jewell was sixth. Would time in the seat help Woodhouse repeat? Would Jewell go out a winner? Would Weber continue a hot streak that began with her Cacchione fences round and was followed by a second to Willeman in team open flat? Or would Willeman continue what was one of the most dominant performances by anyone ever at an IHSA Nationals show? 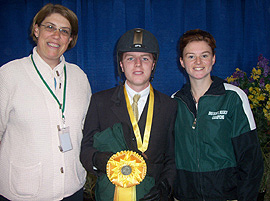 From left to right are Dartmouth College Head Coach Sally Batton and two her open riders, Tim Malone and Daisy Freund. In 2005, Freund finished ahead of Malone in the Zone 1, Region 2 Open Rider Standings for the right to compete for the Cacchione Cup at Nationals. In 2006 Malone turned the table, and finished in third place overall. The test involved a series of fences and at least one abrupt halt. One-by-one each rider took their turn, with scores announced after each ride. Woodhouse's shot at consecutive cups went by the boards when she scored a '79' in the work-off, one of the two lowest announced totals. Malone, who had been sixth through two phases earned an '89' in the work-off, likely elevating him into the top five. Jewell managed a '90,' the second highest score in the division, which would certainly put the senior from Pennington, New Jersey in reserve status. It would be wrong to say Willeman was slightly better. Her effort in the work-off was awarded a score of '94,' the highest score given to any IHSA Hunter Seat rider at an IHSA National Show this decade. Willeman was MUCH better! When her score was announced the Stanford faithful were at their loudest, as it was obvious that Willeman was shortly to receive the 2006 Cacchione Cup. A visit to the Stanford team web site (http://www.stanford.edu/group/set/team/team-home.html) is the best way to view Willemans' many non-IHSA accomplishments. Among them include the 2000 USA Equestrian Junior Equestrian of the Year and 2000 Chronicle of the Horse Hunter Horseman of the Year honors and championships in the 1998 WIHS Equitation Classic Finals, the 2000 USET Talent Search Finals and 2000 AHSA Medal Finals. The senior from South Hamilton, Massachusetts apparently took time off from major competitive riding for a few years earlier this decade but now manages her own show stable which houses her Dutch Warmblood, a Belgian Stallion and even a quarter horse she purchased to give Reining a try! Following the work-off, announcer Ken Marash asked all ten riders to enter the ring for the awarding of ribbons and the cup itself. Tenth place went to Woodhouse, who will have one more season at Skidmore to try and repeat her 2005 performance. Ninth went to Keefe, who scored an '81' in the work-off, essentially elevating her one place in the standings. Cooper was eighth but would finish second in individual open on the flat two classes and a parade later. Lane was seventh while Siegel's storied career at SCAD came to an end with sixth place. Besides becoming the first member of the Bees to compete at Nationals for the Cup, Siegel played a large part in SCAD's 2003-04 Zone 5, Region 3 Region Championship, to date their only season advancing a full team to Zone 5 Zones. 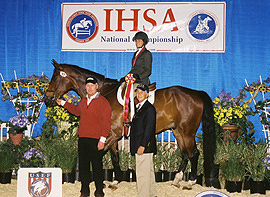 No one dominated 2006 IHSA Nationals more than Stanford senior Sarah Willeman (on horse). Willeman won four of the five classes she appeared in over the course of three days, including the Cacchione Cup. The Cup is not in fact named after IHSA Founder and Executive Director Bob Cacchione (who is holding the cup in this picture) but rather after his father Mario "Marty" Cacchione. Willeman was first in the flat phase (a '92' score), third in the jumping phase and first again in the work-off (a '94!'). Delzers' '85.5' in the work-off kept her in fifth place while Weber earned an '88' and fourth. By earning an '89' Malone snuck ahead of Weber, as his scores of '89.5,' '80' and '89' added to 259.5 while Webers' three rides added to 257. Though she would finish sixth in individual open flat later in the day, Jewells' penultimate performance would have been good enough to win the Cacchione almost any season but this one. Into the '90's in both the flat phase and the work-off, Jewell took reserve with a combined score of 262. Prior to Jewells' arrival in Bristol, the Cobras had yet to take the Champion or Reserve Champion Team Ribbons at Nationals. In Jewell's four seasons at VI, the Cobras were twice National Champion Team and scored at least 14 points at Nationals each season. Willeman, who would also win the individual open flat shortly before 2:00PM Eastern Time later in the day (concluding the english classes until September), was of course the 2006 winner of the Cacchione Cup. Named for Mario 'Marty' Cacchione (whose son Bob founded the IHSA in 1967 and has served as Executive Director since), the cup had never been awarded to a rider from a school west of Ohio until this day. With the recent upgrades to Stanford's Red Barn Equestrian Center, the Cacchione Cup will hopefully be on display behind glass in their Palo Alto riding facility by the time your read this. Willemans' scores added up to '273,' a remarkable 27 points ahead of Woodhouse and eleven more than Jewell. This writer could use terms like 'Exceptional' or 'Amazing' to describe Willemans' performance, and 'Superior' is also a good one. There is not much more you can say about it.